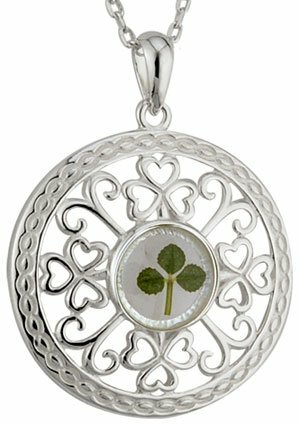 Beautiful shamrock pendant with real shamrock centerpiece. Sterling silver Celtic pendant with a real shamrock centerpiece. Measures 28mm wide and 35mm high (including bale). The shamrock is perfectly preserved in a transparent resin. Handcrafted in Dublin and hallmarked at the Irish Assay Office in Dublin Castle. Fitted with 18″ sterling silver chain.